Unsure of materials. 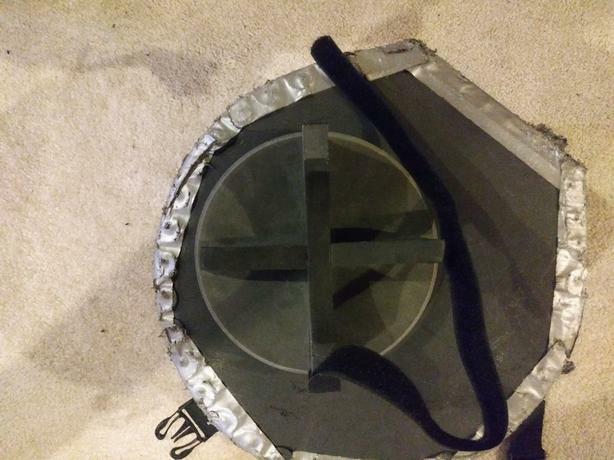 Practice pad comes with a velcro leg strap (attached). Unsure of brand. There is a U shaped leg rest going North/South and one going East/West underneath which creates a rounded contour to go on top of your leg. Can't guarantee it will fit everyone properly. The velcro strap is in good condition but it is somewhat crudely stapled to the side (I believe it came that way and that it is secure.). I would describe the velcro strength/hold as medium. It is bulkier then some of the new models on the market right now but still fairly portable. It is one of the quieter practice pads. Playing surface is just under 6.5 inches and circular. About 1cm below the playing surface there is also a hard section that sticks out about 1 cm which can be used for a 2nd sound but would be awkward to reach and not sure if it is really meant to be played on (would likely create a wood block type sound). Not sure if this can stay attached while walking around (i.e. sliding down your leg etc..) but it's possible. Used moderately and in very good condition. Purchased maybe 10 to 15 year ago but I don't think it was played on much. May have been left in the car (outside) for long periods of time in very cold, very hot temperatures and very humid and very dry conditions. Not sure what this may have done to the adhesive that keeps the pad and the backing together- but it seems very solid and in good working condition. 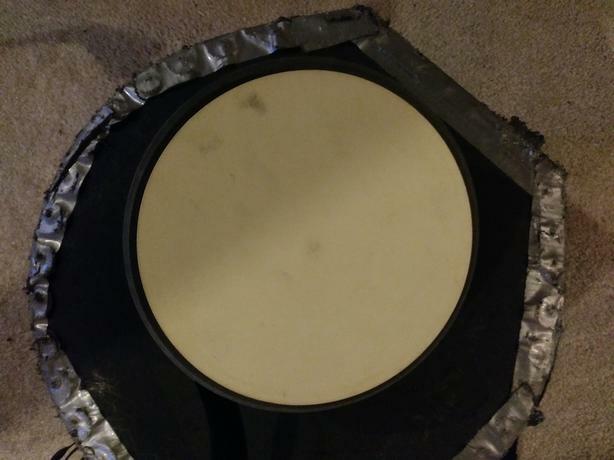 Asking Price: I'm asking $23 Canadian Total for this, however in fairness I will let you know that they have some similar pads (some of which are smaller and some of which are about the same size) in approximately the $17, 25 and $35 range at Long and McQuades.